Fleas are a group of tiny, secondarily wingless (their ancestors had wings, but modern-day fleas don't), parasitic insects that belong to and together comprise the taxonomic order Siphonaptera. There are about 2,500 species of fleas, all of which feed on the blood of warm-blooded animals, including humans. 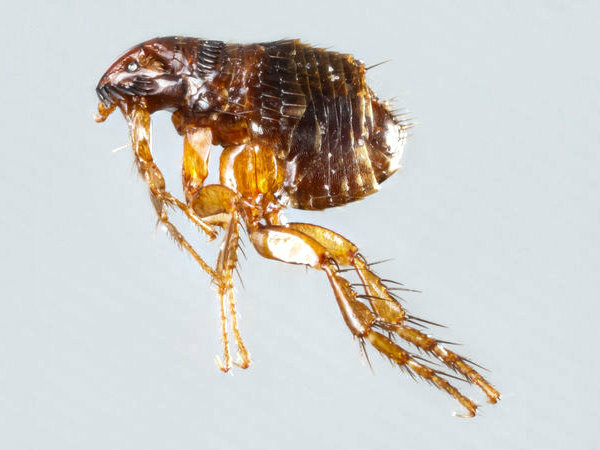 All fleas have laterally flattened bodies (in other words, they're taller than they are wide), and are about the size of a pin head, on average. They have rear legs adapted to jumping and specially-adapted, piercing-sucking mouthparts with which they puncture the skin of their hosts and draw blood. Most flea species have common names (and sometimes taxonomic names) named after their preferred hosts, such as dog fleas, cat fleas, human fleas, and so forth. But if the preferred host implied by their name isn't available, fleas will simply infest another animal instead. Pretty much any warm-blooded animal will do in a pinch if a flea gets hungry enough. Adult fleas have well-developed legs and can jump quite high. They also have hooked claws on their rear feet that help them remain attached to their hosts' bodies long enough to draw a blood meal. They use their strong legs and their claws to jump onto and cling to a host animal's body after having jumped, fallen or been shaken or scratched off the body of another host. In fact, fleas spend quite a bit of their time jumping from host to host, which is one way they spread disease. This habit of staying on one animal until they've had their fill is also how the fleas themselves get moved around from one place to another. In nature, it's one of the ways that fleas increase their range. In human-occupied homes, it's how they spread throughout the house. The fleas hitchhike on pets (and sometimes humans), and get transported throughout the home. Fleas develop by complete metamorphosis: They start out as eggs, spend some time as larvae, and pupate into adults. The entire developmental cycle from egg to adult can occur in as little as two weeks under ideal conditions (that is, with abundant food and sufficient warmth), but usually takes a bit longer. Adult female fleas usually deposit their eggs loosely in the hair or fur of a suitable host or in its lair. The eggs hatch into the first of three legless, eyeless larval stages. The larvae do not draw blood. They have chewing mouthparts and thrive on the feces of adult fleas, although they will eat virtually any kind of organic matter in a pinch. After completing the nymphal stage of their development, fleas pupate in silken cocoons until stimulated to emerge by an event in their environment that tells them that there is a suitable host nearby. 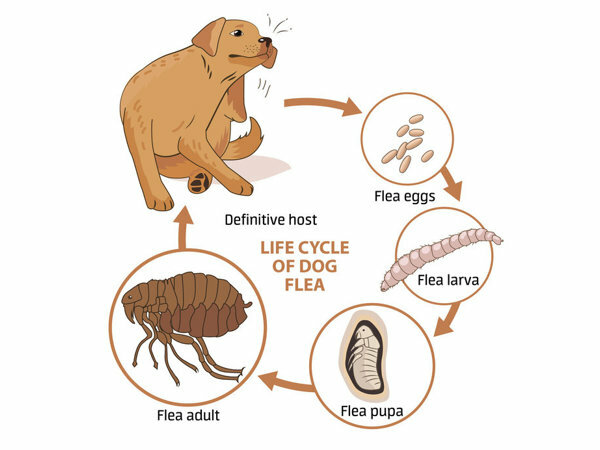 Depending on the specie of flea and the environment, clues that fleas use to detect the presence of a host may include the vibration as the animal walks by, the warmth it gives off, its scent, or the carbon dioxide it exhales. If a pupating flea doesn't detect a host animal, it can remain in a dormancy-like state inside the cocoon for many months. Adult fleas use these same cues to find hosts, plus their vision in most species. Fleas have either simple eyes or no eyes at all. Those who have eyes are believed to have vision adapted to seeing shadows of passing hosts. All adult fleas feed solely on blood, but like pupae, they can survive for months between meals if no host is available. Like most parasitic insects, female fleas must consume at least one blood meal before they can lay eggs. 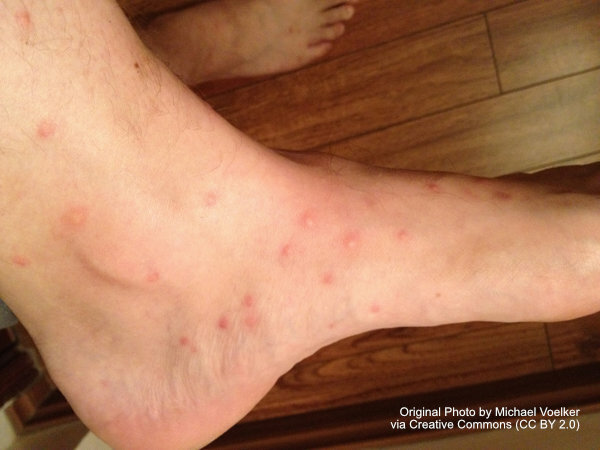 Fleas are required vectors of Yersinia pestis, the bacterium that causes bubonic plague. During the fourteenth century A.D., plague killed perhaps as many as one-quarter of the world's known population. Fleas transmit the plague bacterium from rats to humans. 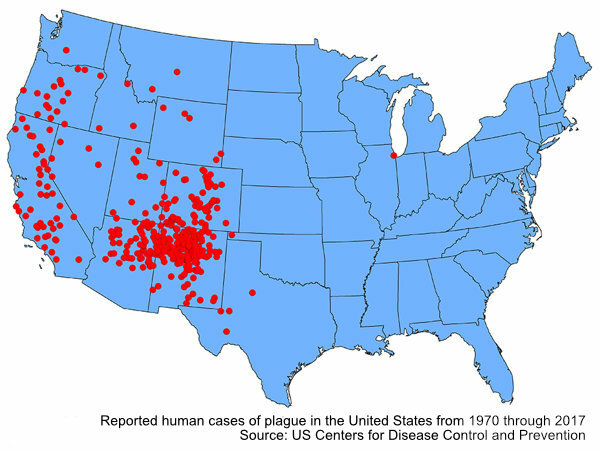 Human cases of plague in the United States have been increasing in recent decades, especially in the Western part of the country. Fleas are vectors of murine typhus, a rickettsial disease that is still common in less-developed nations where sanitation and pest control are lacking. Flea bites can cause a serious rash known as fleabite dermatitis in both pets and humans. Fleas carry an intermediate stage of stage of Dipylidium caninum (more commonly known as tapeworms) which can infest humans who accidentally ingest infected fleas. The importance of fleas as disease vectors and the difficulty of treating flea problems makes flea control one of the more important and challenging jobs in pest control.